New Delhi, Delhi, India : – Preferred Hotels & Resorts – the world’s largest independent hotel brand with more than 650 unique member hotels, resorts, and residences across 85 countries – today kicked off its Asia Pacific series of 50thAnniversary celebrations at The Leela Palace New Delhi with a specially curated afternoon luncheon presentation at Le Cirque, hosted by CEO Lindsey Ueberroth and Executive Vice President Saurabh Rai. 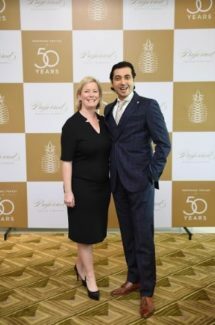 Looking ahead, Preferred Hotels & Resorts is aiming to grow their portfolio in the South Asian region by 10, to make it 50 hotel members by the year 2020. In light of ever-growing consumer appeal for residential-style vacation alternatives, the company will place a concerted focus on growing its Preferred Residences collection, which now stands at 70 members globally, with a goal of reaching 100 destinations by the year’s end. To support this, the company will re-launch the Preferred brand website (PreferredHotels.com), offering travelers a more intuitive way to book independent hotels and residences. The new website will feature a dedicated section on Preferred Residences to enhance engagement with family, corporate, and leisure travelers, and drive direct more direct bookings to the properties in the collection. The I Prefer Hotel Rewards program is the other corporate priority for the year, and the company will be introducing new enhancements to member benefits and exclusive offers that will leverage on the Golden Anniversary campaign and its social components to further strengthen engagement with their loyal guests. To date, I Prefer has more than 2.5 million members worldwide. A year-long Golden Anniversary package, offering unique 50th anniversary-themed activities, amenities, or services to guests staying at nearly 300 participating hotels worldwide. An exclusive Golden Anniversary microsite and social media hashtag #PreferredCelebrates50 for its online travel community. Travelers sharing their most memorable experiences with the hashtag have a chance to get featured on the brand’s social media accounts @PreferredHotels and microsite. Its first-ever dynamic consumer video series, entitled Inspiring Travel for 50 Years. Each month, up to two vignettes will be released via various digital and social media channels, with every video showcasing the rich meaning of #ThePreferredLife. For more information on the Golden Anniversary and how the brand commemorates inspiring travel for 50 years, visit preferredhotels.com/preferredcelebrates50. Since its foundation on January 29, 1968, the Preferred brand has led the way in independent hospitality, helping to shape and develop the space through innovative programming, global expertise, and an unwavering commitment to championing the spirit of the independent hotelier and the unique, authentic, and local character of their respective properties. In the 14 years since the Ueberroth family took ownership, the brand has accelerated its expansion by marking first-time presence in more than 30 new countries; introducing new technology, sales, and marketing support services to its growing portfolio of member hotels; launching I Prefer Hotel Rewards, the world’s first global points-based guest loyalty program for independent hotels; and introducing a variety of other niche programs to cater to the needs of family, LGBT, and golf travelers. Preferred Hotels & Resorts is the world’s largest independent hotel brand, representing more than 650 distinctive hotels, resorts, residences, and unique hotel groups across 85 countries. Through its five global collections, Preferred Hotels & Resorts connects discerning travelers to the singular luxury hospitality experience that meets their life and style preferences for each occasion. Every property within the portfolio maintains the high quality standards and unparalleled service levels required by the Preferred Hotels & Resorts Integrated Quality Assurance Program. The I Prefer℠ Hotel Rewards program, Preferred Residences℠, Preferred Family℠, Preferred Pride℠, and Preferred Golf™ offer valuable benefits for travelers seeking a unique experience. For more information, please visit PreferredHotels.com.